French Guiana has welcomed another payload for Arianespace’s 2017 mission schedule with the arrival of SES-15, the first hybrid satellite for SES, which will be launched in April using a medium-lift Soyuz. The protective container with SES-15 is unloaded at Félix Eboué Airport near the French Guiana capital city of Cayenne. This Boeing-built spacecraft was flown in aboard an AN-124 cargo jetliner, then transferred by road to the Spaceport. SES-15 was delivered by a cargo jetliner that landed at Félix Eboué Airport near Cayenne. After unloading within a protective shipping container, the satellite was readied for transfer by road to the Spaceport. Designed and manufactured by Boeing, SES-15 is equipped with an electric propulsion system for orbit-raising and on orbit maneuvers. Its relay payload has been configured with Ku-band wide beams, along with Ku- and Ka-band HTS capability. The satellite also carries a Wide Area Augmentation System (WAAS) hosted payload to further enhance civil aviation navigation with the Global Positioning System (GPS). Image is courtesy of the satellite's builder, Boeing. 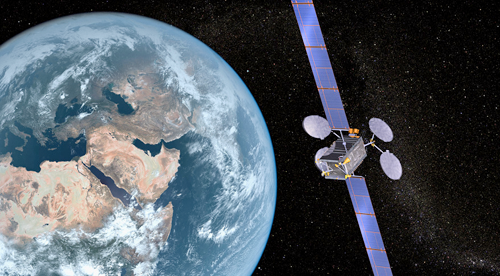 After its deployment into geostationary transfer orbit by Soyuz on Arianespace Flight VS17, SES-15 will operate at the new SES orbital position of 129 degrees West for coverage of North America, Mexico, Central America and the Caribbean. Flight VS17 will be the 17th mission performed from French Guiana with Soyuz since the medium-lift launcher’s operational debut in 2011 at the Spaceport. It marks the second Soyuz mission for Arianespace in 2017, following Flight VS16 in January—which was the launch vehicle’s initial trajectory to geostationary transfer orbit from the Spaceport, delivering the Hispasat 36W-1 telecommunications satellite.